A long time ago, when I was still trying the occasional felt story, I put together a felt version of Inch By Inch. 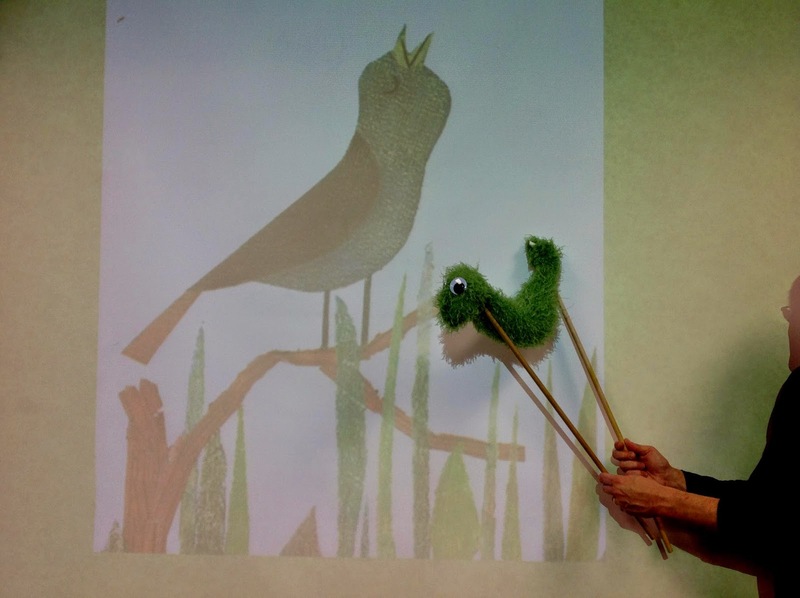 I traced the birds from the book and used a little finger puppet worm to measure each one...I think it was just a green tube with an eye on it. I soon decided that cutting things out of felt was not a skill I had and never would be, but this is one of the stories I remember as being pretty easy to create and fun to do. A couple decades later, it was interesting to take the same idea and use a mix of technology and puppetry to tell it again. In the book, an inchworm measures a bunch of birds. When a nightingale insists that he measure her song, he inches away to safety while the bird sings. For the PowerPoint presentation, I scanned each bird illustration from the book. For an inchworm, I made a simple stick puppet, based on the ones on this neat Etsy page. I don't make puppets often, so you know this couldn't have been hard. Just a couple of dowels, a green boa thing we had around, and two big google eyes. When each bird appears, the inchworm measures it. That just means slowly moving the rods together and apart to make the worm inch along the screen. I asked the kids to count along with me, from the long neck of the Flamingo (10 measurements) to "the whole Hummingbird" (just 1). As always when you're interacting with the screen, you have to remember to make the puppet do its things, but also be sure to face the audience most of the time, since you're the storyteller, not just the puppeteer. The story is so simple that it's easy to learn, and captures the kids' attention very nicely. 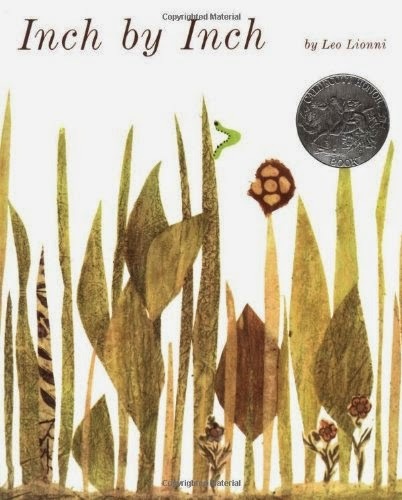 I did try to memorize the author's phrasing, because I just like the way he writes ("an inchworm, green as an emerald...") And the scanning was straightforward, since Lionni's illustrations are so compelling. I did have to make sure to white out the inchworm from each image, since I had my own. 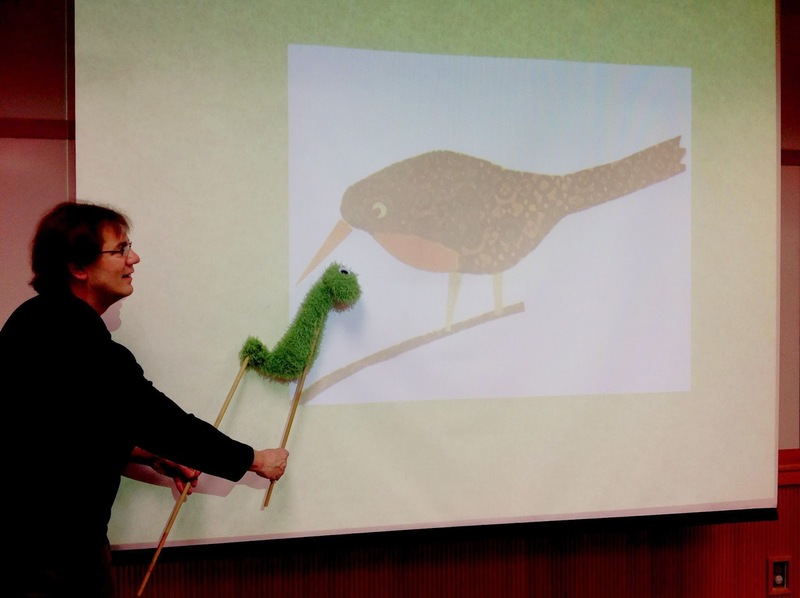 When the Robin carries the inchworm "to where other birds wanted to be measured," I put the puppet alongside the Robin's back and had the image fly slowly across the screen (with a Motion Path from PowerPoint), bringing the puppet along with it. Our other effect was to add a clip of an actual Nightingale song downloaded from Freesound.org. 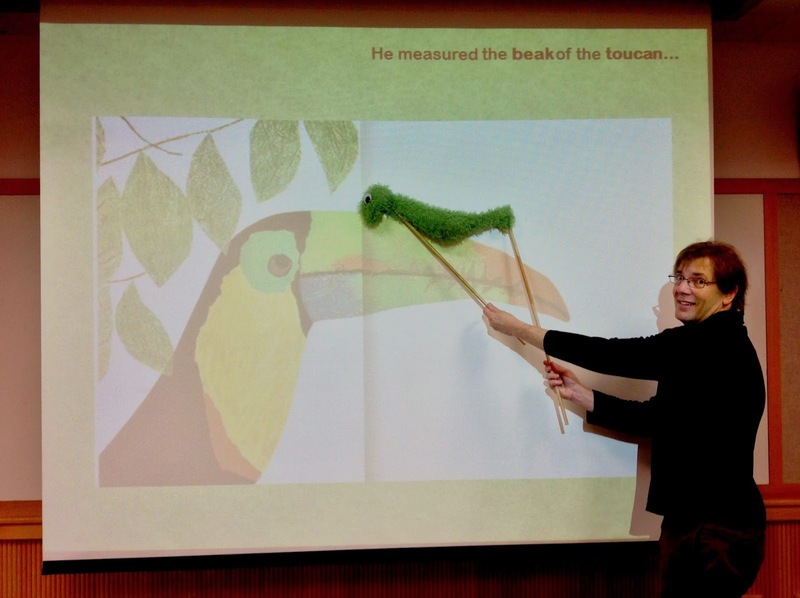 The song played while the inchworm "measured away, measured and measured, inch by inch...," with the puppet inching along the plants across the screen. When he finally "inched out of sight," the puppet slips behind the screen. It all stayed true to the book, but the technology/puppet combination made it work quite nicely for our big groups. Plus I kind of enjoy using technology to present a classic. One that's so old, as I mentioned in my introduction, that it was first published the same year I was born! Which I don't think means that much to the preschoolers, but it boggles my mind a bit. This is great! I have yet to try a "techno story" but this seems one that would be REALLY fun to try. I really love it! Thanks for providing links to the freesound.org--so helpful! Thanks for all the work you do and the willingness to share your GREAT ideas!